An acknowledgment is something said or done to inform another that his statement or action has been noted, understood and received. Purpose: To acquire the skill of totally, completely and finally acknowledging a statement, observation or comment in such a way that the person making it is happy with the fact that it has been wholly received and understood and feels no need to repeat or continue it. Acknowledgment is a control factor in the cycle of communication. This is true of any communication cycle in any type of situation. The formula of control is start, change and stop. If you can start something, change it and then stop it, you are in control of it. An acknowledgment is a “stop.” Therefore, if one acknowledges the communications of others properly, he can control communication. If you said to someone, “Keep going” or “Keep talking,” you would not be acknowledging him. The perfect acknowledgment communicates only this: I have heard your communication. It signalizes that the person’s communication to you has been received. It isn’t the word that ends a cycle of communication, it’s the intention that ends it. In life, it is actually very therapeutic for a person to know that he has been acknowledged. Commands: The coach reads lines from Alice in Wonderland, omitting the “he said’s,” and the student thoroughly acknowledges them. The student says “Good,” “Fine,” “Okay,” “I heard that,” anything only so long as it is appropriate to the person’s communication—in such a way as actually to convince the person who is sitting there that he has heard it. The coach repeats any line he feels was not truly acknowledged. 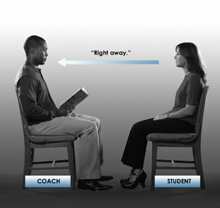 Position: Student and coach are seated facing each other at a comfortable distance apart. Training Stress: The student must acknowledge in such a way that the coach is convinced there is no need to repeat himself, that it has been received and understood, totally and finally. The student does this by intending that the communication cycle ends at that point and ending it there. Anything the student does to make that come about is legitimate provided that it does not dismay or upset the coach. The student acknowledges in a manner appropriate to the coach’s communication and convinces the coach that he has received it. Ask the student from time to time what was said. Curb over- and under-acknowledgment. Let the student do anything at first to get acknowledgment across, then even him out. Teach him that an acknowledgment is a stop, not the beginning of a new cycle of communication or an encouragement to another to go on and that an acknowledgment must be appropriate for the person’s communication. The student must not develop the habit of robotically using “Good,” “Thank you” as the only acknowledgments. Another point of this drill is to teach further that one can fail to get an acknowledgment across or can fail to stop a person with an acknowledgment or can take a person’s head off with an acknowledgment which is overdone. This drill is passed only when the student can totally, completely and finally acknowledge a statement, observation or comment in such a way that the person making it is happy with the fact that it has been wholly received and understood and feels no need to repeat it or continue it.